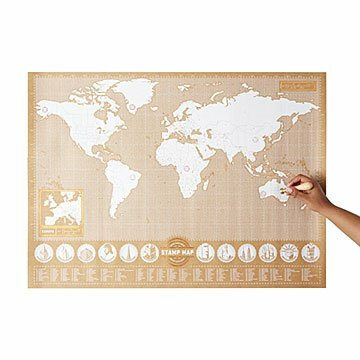 Track your past and future global adventures with this customizable travel map. If it's Tuesday, it must be Barcelona. Track your global adventures—and plan your next selfie-worthy spot—with this customizable travel map. Printed on heavyweight kraft paper with eye-catching copper foil details, it's a world-class way to display the destinations already crossed off your bucket list and the ongoing objects of your wanderlust. The included brass stamps and ink pads let you customize the poster as you travel: an "X" stamp to mark where you want to go and a "Visited" stamp to commemorate where you've been. The bottom section shows world landmarks—from Chichen Itza to Neuschwanstein—to help you hit all the highlights of each country. Hang prominently and keep your passport handy. Made in China. Includes two brass stamps with red and black ink pads. One stamp is an "X" to mark where you would like to go and the other is "Visited" to mark where you have been. The "visited" stamp doesn't work. The circular part is raised hight than the "visited" portion of the stamp. The map itself looks good. Pretty irritating. Loved this map. Would have even loved it better if it had been larger so more stamps could fit into Europe, but still very nice way to signify a trip or bucket list stops.